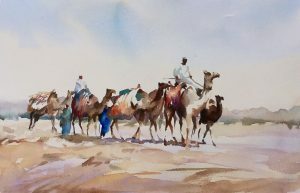 A fresh and pleasing composition of a desert group or caravan of people and camels as it makes it’s way across a desert terrain. Light luminous washes permeate this watercolour by Trevor, and the brisk handling of brushstrokes brings movement and life to the image. This iconic piece shows the artist’s abilities in economy of handling and brevity of brushwork, rendering a complex scene in simple terms.